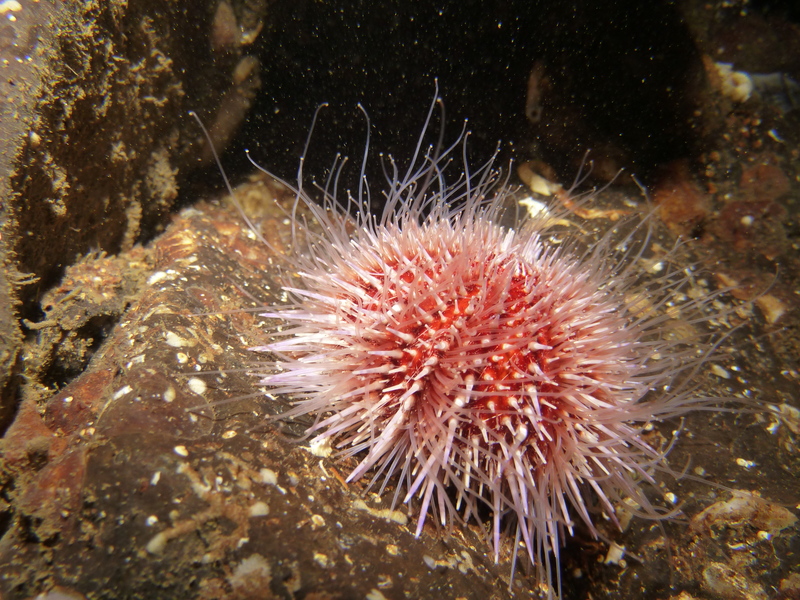 Diving with an objective adds a little extra to a days entertainment and so it was that we engaged in a survey for one of the least understood of Scotland’s marine invertebrates. 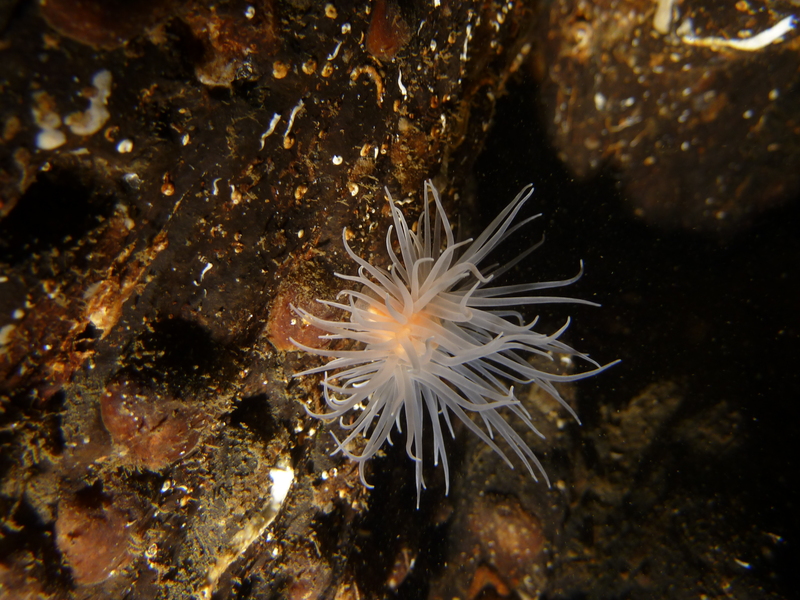 There are many organisations and groups that document sighting of our native marine life and when a rare species is seen many people will go out of their way to visit sites with a view to finding and photographing the organism. Over the last few years an invasive species, the hard-shelled, yellow back sea slug , also known as the Yellowshell, has gradually increased in abundance around our coastline. While most sighting have been associated with extreme depth or sites requiring a hardboat to access them, more and more often, reports have filtered through that they have been spotted near the shore. This then was our objective, to find and photograph this elusive beastie. Perth-BSAC is not without some academic expertise when it comes to marine life identification, BSc’s, MSc’s and even a PhD or two abound not withstanding the enormous experience of the lay person with decades of actual diving experience and yet with all our combined knowledge there was perhaps only a handful of people who had reported seeing these animals in the wild and fewer still who actually admitted knowing a few rudimentary facts about their habits. What was known was that these shelled invertebrates were slow moving, usually dragging themselves along the bottom trailing vast amounts a silt, presumably a defensive mechanism to stop themselves becoming prey of the more aggressive scallop baggers. It had also been reported that they had been sighted recently in Loch Leven and so the venue for the search was set. A crack team of five divers met a local expert at Craft’n’things in Ballachulish for 09:30 opening and after a bacon roll and a coffee, a detailed briefing was delivered on how best , given the combined, or rather lack of knowledge, to approach, photograph and possibly collect a specimen. My copy of the Safe Diving practices booklet on close inspection seemed to be missing any guidelines on this subject but it was possibly included in the appendix marked fictional creatures and dragons. A short transfer to the site and the first wave, equipped with torches, probes and specimen collection jars was duly dispatched on the initial search, the objective was to confirm the site details, identify any potential dangers involved in specimen collection, identify suitable survey areas and report back to the surface support team, where upon the survey teams would enter the water to photograph and collect a specimen. Soon it became clear, by the surface bubble patterns, that a battle royale was in progress and the second team was dispatched to provide assistance. In went the second team and immediately swan perpendicular to the direction the first team had taken avoiding all contact and enjoying excellent vis and fish life. The first team surfaced on time reporting no sightings but an enjoyable dive around the main reef. Meanwhile the second team, while feeling that they were always very close to a Yellowshell, never actually identified either a silt trail or the animal itself and surfacing an hour later reported drawing a blank. The final team, surveying the reef at a slightly shallower depth, reported finding a silt trail left by a yellow hardback but again did not actually spot the animal. They reported another excellent dive with some very large saithe, pollack and ling as well as the varied squidgy life this reef is well known for. With all teams on the surface and time for lunch a review of the survey techniques was called for and changes implemented. A slightly different search area was called for and the first wave, wanting to complete the survey data for the primary search area, retraced their steps in reverse to ensure the beastie was not hiding beneath some small overhang. The remaining teams decided the second reef was more likely to be a potential habitat and set off to survey it. Out and back went the first team shortly followed by the last group who at the turn reported a sighting ironically as they passed the other group on the way back. Clearly group two had by this time become despondent and had given up surveying, looking instead for other marine life and fishing weights attached to mono filament which was collected where possible. The sighting was of interest but without corroborative evidence other than some Lochness monster style images taken from a camera, shaken in the excitement of the encounter and we are still not able to confirm the existence of the elusive Yellowshell. Anecdotal evidence provided by the third team seemed to suggest that the animal was a poor free swimmer, tending instead to bump along the bottom creating it’s silt trail. They did report that they would need a larger catch bag to land a specimen. Well there you have it. Perth-BSAC first attempt at surveying for the Yellowshell, some success and a steep learning curve for all involved. With this experience it is hoped that we will be able to get much more conclusive evidence on future dives and unequivocally demonstrate the existence of this creature on some if not all of our dive sites. Thanks all for coming and supporting this event and I look forward to working with you in future. You don’t always get sunshine and apparently this Saturday’s event at Loch Fyne was a wet affair though we were able to change in and out of dry-suits in the dry and enjoyed some pleasantly warm water. With the usual drop outs and no shows there were still loads of people looking for a dive or a lesson so after our brief, the students were allocated and the lessons started. Maureen and Fred went off on a navigational exercise exploring the inner reef and reported finding a garden gnome. A good result this and rumors that the find was a result of narcosis were disproved by the following team who also found a garden gnome. Haydn and Duane were out again getting instruction from Claire, the newest qualified member of the instructor team and reported varying degrees of success struggling with blocked sinuses and weighting issues associated with new equipment. But this is why we support these events, they give us a chance to find out how we deal with these issues in a relatively sheltered environment before we jump into some off shore site and end up calling out the emergency services. Simon spent the day practicing buoyancy and pilotage skills with Steve and Edwards and great improvements were reported. Frank, a friend of the Club, who has helped us out on several occasions was around today having recently returned from a diving trip to some exotic location and was involved in Dive Leader training. I was working with Bethan giving her a chance to try out some instructional skills as practice for future instructor exams. Being thrown in at the deep end with a dive leader Alternate Source exercise the lesson was perhaps a little ambitious so we worked on practicing the preparation and briefing before handing over the inwater mask clearing and AS skills. (Though Bethan does them better ! – Ed). One minor mishaps saw a student coughing and spluttering during a mask clear , cause for concern as he eyed the surface……. Took a while to calm down! AS drills ok and the use of a little datum line proved very useful in controlling the ascents as we bobbed up and down. After lunch we decided to do some dive leader drills and the students took it in turn to plan and then lead the dive. Both, having led several dives before, did very well. From my point of view and as a learning point, simulating a problem by dropping a fin is NOT a good idea when the fin floats away and has to be retrieved!!! The usual problems such as swimming off in the wrong directions, gradual drift down slope and getting fixated on something were all handled very well and I have to say I’d be more than happy to be taken for a dive by both of them or more importantly to see them lead an Ocean diver! Ended the dive by completing the circumnavigation of the reef and tying a small plastic bottle on 2m of line to the 54lb weight that I have been playing with on the inner reef, the idea is that it will be easier to find.